Juan Orlando Hernández, who was “elected” president in Honduras as a result of fraud and corruption, will hold his swearing in ceremony on January 27 in what may be the first closed-door inauguration (although his government has purposely not shared details about the ceremony). Leading up to what many consider will be an illegitimate inauguration, social movements and organization, sectors of the political opposition and members of civil society have been mobilizing across Honduras to show their rejection and indignation to the political situation in Honduras that did not begin with electoral fraud but has also highlighted the impunity and unreeled power of the military and police to repress, detain and kill citizens at an alarming rate. 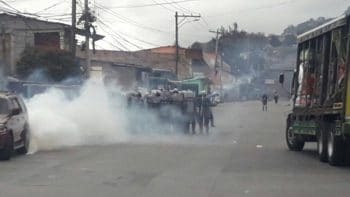 Just this morning there was another mortal victim of state repression. 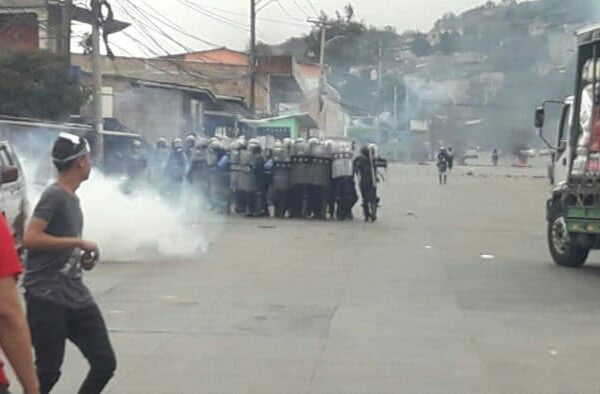 Community members from Pajuiles, Tela, Atlántida report that a 35 year old man was killed by men dressed as police who came to his house and said they were detaining him and then took him to the highway and shot him 40 times. 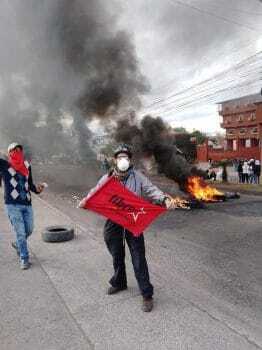 Yesterday Ramón Fiallos who was the coordinator of the community sector of the Movimiento Amplio por la Dignidad y la Justicia (Broad Movement for Dignity and Justice) died after he was shot while participating in a highway blockade in the department of Atlántida. 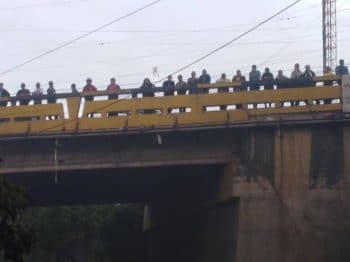 On Saturday, a 60 year old peasant also died in the middle of protests after being shot with live ammunition in the protests in Sabá in the department of Colón, apparently his last words were “Help me compa” (compa is the short version of compañero/a which can mean friend, comrade, colleague). These last three deaths are added to the list of around 40 known deaths (estimates vary between 30 and 40) in the context of the mobilizations since late November. Human rights organizations have denounced that over 1,000 people have been detained since the protests against the fraud began in November and hundreds have been injured as a result of the brutal repression by the Police and the Army. In a press conference last January 16, the Alliance of the Opposition called for a series of mobilizations under the name Operation Fuera JOH. The series of actions also is putting forth some demands from the opposition to revert the imposition of the fraud. They demand a forensic audit to the System of Transmission and Disclosure of Electoral results until January 27 and after this date they will call for a National Original Constituent Assembly. “As of January 27, the Alliance of Opposition will not recognize public authority, because as of this day the rule of law as we know it will be broken, since it will be taken hostage by usurpers that have imposed their rule by force and electoral fraud,” they declared. 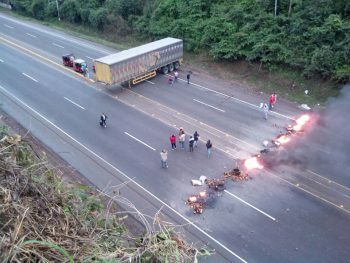 The Operation began with a national strike last January 20 where more than 44 highway blockades were reported in different parts of the country; in addition to marches, rallies and other actions held in the principal cities of the country. 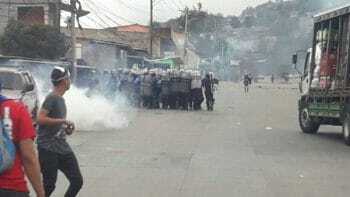 It continued on Sunday January 21 and there was also a mobilization in front of the National Congress in Tegucigalpa. On January 25, 26 and 27 different mobilizations were called for on a national level in different public ways and in the international airports. 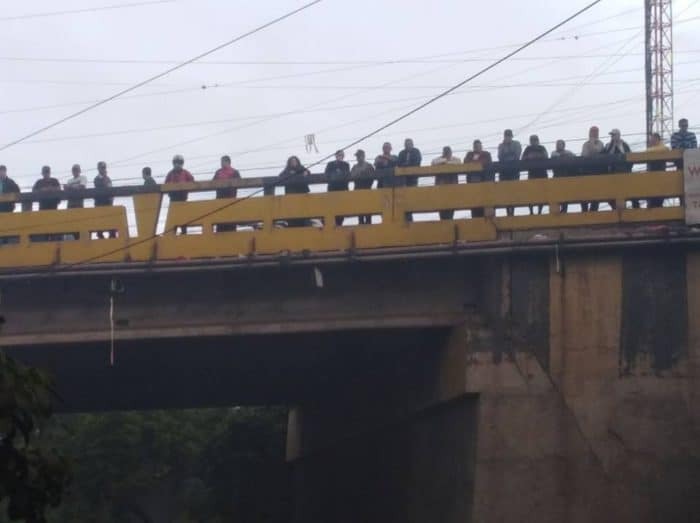 The central activity will be held on the 27 with a big mobilization towards the National Stadium, where it is assumed that the inauguration of JOH will happen. 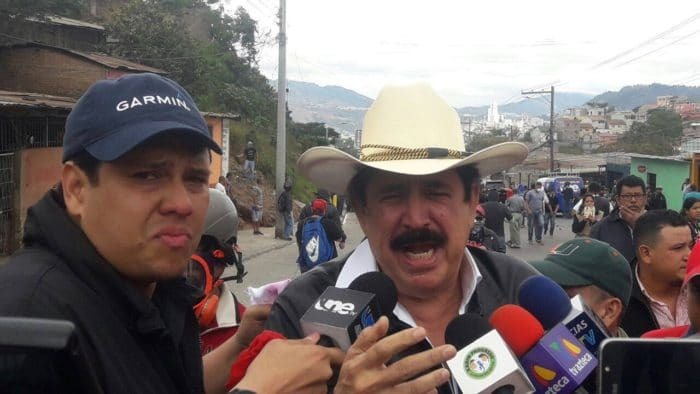 The government lead by Juan Orlando Hernández has maintained a discourse where they affirm his reelection and they make a call for “peace and national reconciliation,” which is the same discourse used by the coup Government of Roberto Micheletti after the coup d’etat in 2009 against Manuel Zelaya. In addition, he calls for a grand dialogue to show that the Government will include the proposals of different political parties. However, they impose their conditions and refuse to have an international mediator and be binding. Along these lines, JOH affirmed that the day of his inauguration will be a celebration of democracy but he proposes that the ceremony be, for the first time, closed door. 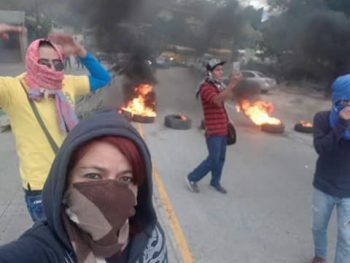 It is with this same discourse of “peace and national reconciliation” that he has summoned the National Police and Armed Forces of Honduras to not tolerate any sort of “acts of vandalism”, but this has translated to every single protest that opposes the fraud has been brutally repressed as is evident by the numbers given above of assassinations, injuries and detentions. 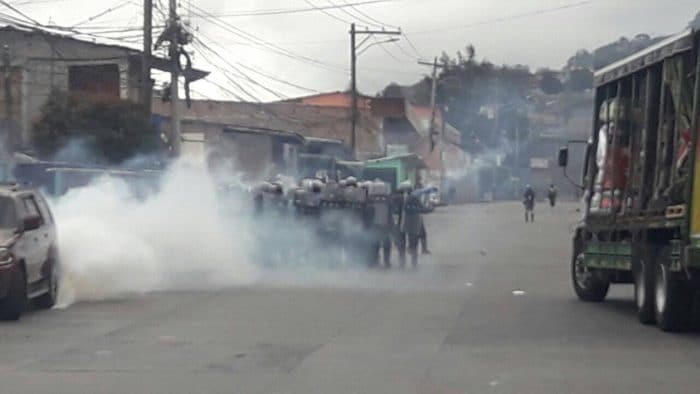 Despite demands by numerous international organizations that the Honduran Government stop their violent repression and the systematic violation of human rights, the Administration continues to ignore them and on the contrary has strengthened its policy of violent repression. It is expected that the repression will get even worse. 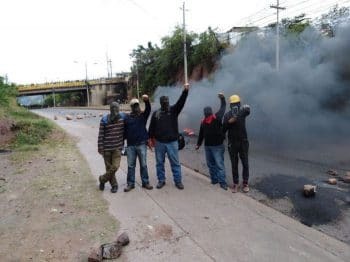 The social movements and human rights defenders denounce that they do not have the minimum guarantees of respect of life.